Pete Buttigieg, a little-known mayor of a modest-sized Midwest city, has become an unlikely rising star in the 2020 Democratic presidential field. How? In just a matter of a month, this 37-year-old - who would be the youngest and the first openly gay US president - has transformed himself from long-shot to legitimate contender for the White House. Speaking to an audience gathered to see him in Manchester, New Hampshire, he admits that his campaign has had a "really good few weeks". "I'm mindful that this is a marathon, he says, "but we're certainly thrilled with the way our message has been resonating." A month ago, the mayor of South Bend, Indiana, was a political afterthought in a Democratic field that seems to be expanding by the day. That was before a well-received nationally televised town hall appearance that caught the attention of political commentators and a public that was, perhaps, in search of a fresh face. Andrew Sullivan of New York Magazine said the mayor might be the best possible Democratic matchup against Donald Trump. "In style, generation, demeanour, and background, Buttigieg is a near-perfect way to put a drop shadow behind all of Trump's grandiosity, age, temperament, and privilege," he writes. Even some on the right have taken note of Buttigieg's potential. Seth Mandel of the Washington Examiner said he is "calm, sane, and funny in a sea of performative-anger posers, and we should be able to appreciate that regardless of politics". The mayor has trended upward in Democratic presidential preference polls since then, including a surprise third-place showing in a recent survey of Iowa Democratic voters. His personal memoir, Shortest Way Home, has appeared twice on the New York Times hardcover non-fiction best-seller list, a feat not achieved by 2020 campaign books of any of his rivals. Perhaps most importantly, this surge of interest in Buttigieg's candidacy has translated into campaign dollars, as he recently announced he has raised more than $7m (£5.3m) in the first three months of 2019. That puts him behind only Bernie Sanders, Kamala Harris and Beto O'Rourke among Democrats who have announced their numbers so far. Buttigieg's crowds have also been swelling at his public appearances. The Friday night event in Manchester had to be moved from a local brewpub to the city's art museum to accommodate a larger turnout - and even then, the venue reached capacity more than a half hour before the mayor was due to speak. "Every time we arrange a meet-and-greet, we wind up with a rally," Mr Buttigieg told his gathered supporters. Buttigieg has become the hot candidate of the moment. On Sunday, in South Bend, he will formally announce the launch of his presidential campaign, probably before an enthusiastic and adoring crowd. In American politics, however, booms are frequently followed by busts and bubbles tend to eventually pop. But even by modern political standards, the Indianan is an unconventional candidate - so perhaps the conventional rules won't apply to him. A city mayor's office is not a typical launching ground for a presidential campaign. In fact, only two former mayors - Grover Cleveland and Calvin Coolidge - have won the White House. No sitting mayor has ever done so, and few have thought to try. A successful presidential bid requires money and visibility, and historically a political profile limited to a single municipality hasn't allowed for either. Buttigieg was first elected to the top job in South Bend, a post-industrial Indiana town best known for being the home of the University of Notre Dame, in November 2011. He won a comfortable re-election in 2015, and first gained some national prominence for an unsuccessful, yet well-received bid to chair the Democratic National Committee in 2017. With a relative paucity of political experience, "Mayor Pete" - as his supporters like to call him - is leaning heavily on his backstory to set him apart in the presidential field. Buttigieg has an elite school pedigree, having attended Harvard and then Oxford as a Rhodes Scholar, where he finished with a first. After his studies, he earned a six-figure salary in Chicago working for the international management consulting company McKinsey and Co, before returning to his home town to try his hand at politics. In 2009 he received a commission as an intelligence officer in the US Naval Reserve, and five years later - two years after being elected mayor of South Bend - he was deployed to Afghanistan for seven months. He has a Midwesterner's plain-spokenness and, as a practising Episcopalian, regularly leavens his public remarks with Biblical quotes and allusions. "He answers every question without ever pivoting, because he's smart enough to talk about any subject," says John Tanzman, a business analyst for a toy company who travelled from nearby Amherst to see Buttigieg speak in Manchester. "There's nothing canned. We really loved Bernie Sanders, but it doesn't take too long before he starts talking about millionaires and billionaires." Buttigieg's resume was enough to get New York Times columnist Frank Bruni to muse in June 2016 that the mayor appeared laboratory-built to be the perfect Democratic candidate. "He seems always to say just the right thing, in just the right tone," he wrote. Then there is the one attribute that sets Buttigieg apart from the rest of this year's Democratic field - and from the rest of any presidential field in history, for that matter. In 2015, shortly in the midst of his mayoral re-election campaign, Buttigieg announced in a column in the local newspaper that he is gay. "Putting something this personal on the pages of a newspaper does not come easy," he wrote in the South Bend Tribune. "But it's clear to me that at a moment like this, being more open about it could do some good." "Being gay has had no bearing on my job performance in business, in the military, or in my current role as mayor," he continued. "It makes me no better or worse at handling a spreadsheet, a rifle, a committee meeting, or a hiring decision." On the campaign trail, Buttigieg doesn't wear his sexuality on his sleeve, and seldom talks about the ground-breaking nature of his candidacy - but his supporters know and recognise it. Some say they're glad, at least for the moment, it has not been the top-line focus of his campaign. Others put it high on their list of his positive attributes. "I admire the fact that he's openly gay," says Celia Botto of Manchester, who came to the Buttigieg event with her husband, Brandon. "I can't believe it's taken this long for an openly gay man to run for president." 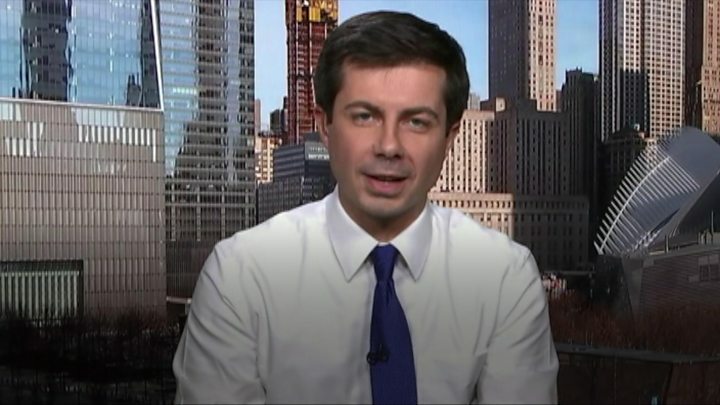 When Buttigieg does mention his sexuality, he does so obliquely - in reference to marriage rights in general or his husband, Chasten, who has become a minor celebrity in his own right, the result of a snarky and irreverent presence on social media. "Obviously I'm pretty biased because I love him," Buttigieg told reporters after his speech in Manchester, "but it's pretty great to see the rest of America starting to fall in love with him, too." 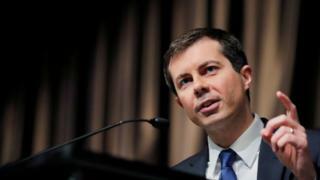 Buttigieg has developed a reputation as an intellectual - he reportedly speaks seven languages and lists Ulysses by James Joyce as a favourite book - and a policy nerd. As a presidential candidate, his proposals are a mix of ambitious governmental reform and incremental legislative advances. He wants to do away with the electoral college and have presidents chosen by a direct popular vote. He has proposed expanding the number of justices on the US Supreme Court, and granting statehood to Washington, DC, and Puerto Rico - a move that would almost certainly strengthen Democratic representation in the US Senate. What is the US electoral college? He advocates universal healthcare, but is aligned with the more moderate Democratic candidates who want to do so through expanding current government-run health programmes, instead of scrapping the current system of private health insurance. He says the idea of free public college education - a big applause line for Bernie Sanders - is a regressive use of tax dollars from the working class to support those who are already destined for higher incomes. He's for the Green New Deal, but as a "concept" and a "framework" that emphasises the emergency the world faces. Buttigieg's stump speech is heavier on vision than these kinds of policy details, however, which mostly come out in interviews and media questioning. "We, as Democrats, being as we are policy people, sometimes forget to talk about the values that motivate our policies," he said in Manchester. He says conservatives talk about the value of freedom in the negative - freedom from government regulation, taxation and control. Democrats, he continues, have to advocate for "freedom to" - freedom to have quality health insurance, or union representation, or reproductive choice (abortion rights), which government can help guarantee. It's reminiscent, intentionally or not, of Franklin Roosevelt's four freedoms - freedom of speech, freedom of religion, freedom from want and freedom from fear. All of Buttigieg's ideas and proposals are framed in the context of generational change. As a Millennial, he is part of a cohort of Americans who will have to deal with the consequences of decisions made now for decades to come. That, in particular, was a powerful message for Barbara and Emma Zaenglein, a mother and daughter who attended the Buttigieg event in Manchester. "In the same way that the Baby Boomers took over, now it is our turn to step up and really be active and engaged," daughter Emma said. "Having a piece of that is really exciting." Mother Barbara agreed. "Now is the moment that we pass the baton from my generation," she said. "I want them to take over. They have a right to be at the table." It takes a certain amount of audacity - some might call it hubris - to make the case that a young mayor is best suited to be president of the US. The experience gap between Buttigieg and the rest of the Democratic field, comprised largely of current and former senators and governors, is real. Buttigieg is only two years older than the minimum age requirement for the role of president, as written into the US Constitution. As a high school pupil in 2000, he won a national essay contest, writing about the courage of Bernie Sanders, who at the time was in his ninth year in the US House of Representatives. "His energy, candour, conviction, and ability to bring people together stand against the current of opportunism, moral compromise and partisanship which runs rampant on the American political scene," the young Buttigieg wrote of his now presidential rival. One can imagine some older Americans - perhaps even his opponents - muttering under their breath that Buttigieg is a typical Millennial - he gets an entry-level job in elective politics, and now he wants to run the whole place? The mayor's counter is that he has more executive experience than the current occupant of the White House and more military experience than the past four. More than that, however, Buttigieg tries to present his youth and outsider status as a strength, not a weakness. He says he hasn't been "marinating" in Washington for decades. He doesn't have as many grey hairs as is customary for a presidential contender. He comes from a small city but small-town values may be what the nation needs right now. When he tells the Manchester crowd that he's probably not how one would picture a president, a few shout back, "Yes, you are!" Buttigieg may have won over the audience in Manchester, but successfully making that case - and dealing with the blowback from it - is going to be a recurring challenge if he wants to turn his current surge into something durable. Last week actor John Leguizamo suggested on Twitter that he hoped for a Democratic 2020 ticket with Buttigieg as the presidential nominee and Kamala Harris as his running mate, prompting a torrent of outraged replies numbering thousands. Harris is a sitting senator from the most populous state in the country, former attorney general of California and, before that, San Francisco's district attorney. Why, they asked, should she take a back seat to a less-qualified male candidate? The same dynamic could play out with many of the other candidates in the race. Buttigieg was a Rhodes scholar? So was Cory Booker. He has local-politics mayoral experience? So does Booker and Julian Castro - and they both governed larger cities. Buttigieg is super-smart with bold ideas? Elizabeth Warren was a professor at Harvard and seems to roll out a detailed new policy proposal every week. Is O'Rourke the heir to Obama? "This isn't to say that Mayor Pete isn't brilliant," tweets feminist author Jill Filipovec. "He is really smart. That is admirable (and should be a quality we emphasise). It is to say that we recognise and applaud brilliance and intelligence in white men, and are less likely to identify it in women and people of colour." Even Buttigieg's gay identity is being questioned from some corners of the left. Christina Cauteracci in Slate writes that the mayor's emphasis on the irrelevance of his sexual preference means he has an "assimilation perspective" and "can be more accurately lumped in with his white male peers than with anyone else". "Has Buttigieg faced setbacks or barriers to success because he's gay?" she asks. "Does he have an identity-specific worldview that would inform his work as much as, say, Harris' experience as a black woman would inform hers? Would a win for Buttigieg be as historically significant and culturally meaningful as a win for a member of an underrepresented race or gender?" Others have pointed out that Buttigieg's Ivy League pedigree and corporate consultant resume make him just a more eloquent face of the same old political establishment. Buttigieg has been able to avoid the kind of ferocity of attacks a frontrunner - or even a top-tier contender - would face for the first few months of his (unofficial) presidential campaign. That may quickly change. After his Manchester speech, the mayor told reporters he believes that there is going to be a fair amount of alignment in the 2020 Democratic field as far as policies and political messages. "What's not yet clear is what kind of messenger can really convey and render this message from coast to coast and have the best shot at beating this president," he says. He thinks that because the US public wants "something entirely new", he can be that messenger. He's found what appears to be a workable answer to the socialism versus capitalism question all Democratic candidates are facing, by saying he's in favour of a "democratic capitalism" that smooths out the harsh edges of the market system and prevents free markets from becoming Russian-style oligarchy. "If we really want to maintain the productivity and the value of the strong business community, we've got to recognise that growth alone isn't enough," he says. "Growth has to actually reach all of us, and that requires good policy." Whether his fellow candidates think it's fair or not, Buttigieg has found a message, and become a messenger, that has attracted national attention - and money. And that affords him staying power - the ability to have a puncher's chance at ending up at the top of this exceptionally crowded field. In the coming months, he'll have to dodge attacks and avoid the kinds of political pitfalls that can blunt momentum. He'll also have to turn what until now has been a skeletal campaign team into one that can translate publicity and attention into actual votes. "We're preparing to have the right team in place and keep growing it so that we can sustain not just crowd energy but individual relationships that I think are really the backbone of any strong campaign," he says. If a presidential campaign is a marathon, Buttigieg's race has only just begun. US election 2020: Nine Democratic candidates. One event. Who shone?